“Sweepstakes Details: *NO PURCHASE NECESSARY. Open to legal residents of the 50 United States (D.C.) 18 years or older. Ends 11:59 p.m. CST on April 30, 2018. For more details, including odds, prize descriptions, and more, see the Official Rules. Void where prohibited. PRIZES: TWENTY (20) GRAND PRIZES: Each Grand Prize winner will receive the following prize package: Xbox One X, Xbox wireless controller, Forza Motorsport 7 t-shirt, Forza Motorsport 7 full-game download. Approximate Retail Value (“ARV”): $650.00. SECOND PRIZES: FIVE HUNDRED FORTY (540): Each Second Prize winner will receive the following prize package: Xbox wireless controller and Forza Motorsport 7 full-game download. ARV: $130.00. Downloadable Content Details: Open to legal residents of the 50 United States (D.C.) 18 years or older. Ends 11:59 p.m. CST on April 30, 2018. The offer will be fulfilled within 24 hours of purchase validation. For complete Terms and Conditions and all details, please see the Official Rules. The maximum amount of redeemable codes is four (4). 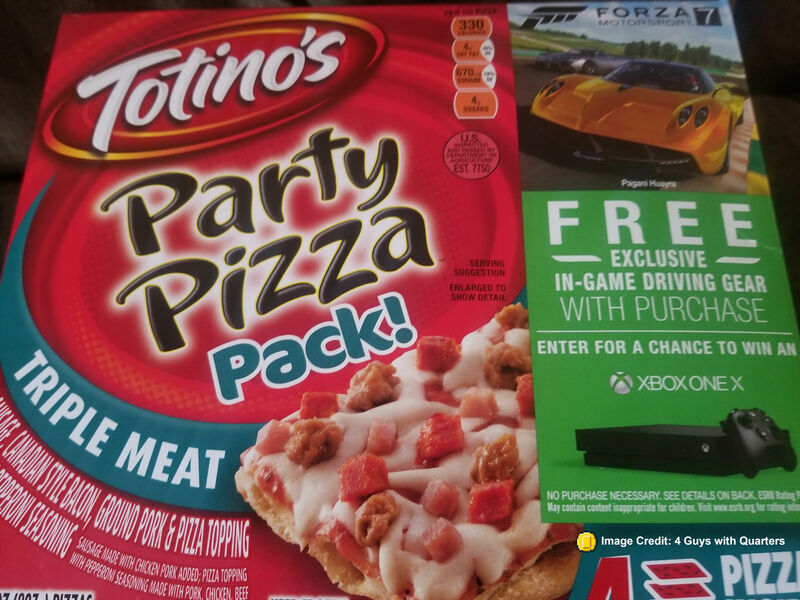 DOWNLOADABLE CONTENT: The first code entered from a qualifying Totino’s™ product will earn you an exclusive in-game liveried car. The second code entered will earn you in-game driving gear. The third code entered will earn you a second exclusive in-game liveried car. Entering one (1) select code from 120 count and Party Pizza Packs will earn you a second set of exclusive in-game driving gear. PARTICIPATING PRODUCTS: Specially marked Totino’s™ Pizza Rolls™ snacks 40 CT (Pepperoni, Combination, and Cheese flavors); 90 CT (Pepperoni, Combination, and Cheese flavors); 120 CT (Pepperoni, Combination, and Triple Meat flavors); 140 CT (Pepperoni and Combination flavors); 160 CT (Pepperoni and Cheese flavors). And specially marked Totino’s™ Party Pizza (Pepperoni, Combination, and Triple Cheese flavors) and Party Pizza Packs (Pepperoni, Combination, Triple Meat, Triple Cheese, and Supreme flavors). Let us know if you plan on entering and what you think of this promotion from Totino’s. Next article4GwQPodcast Ep151 – Battlefront 2 Beta Wrap-Up, Microtransactions, Fortnite 10M+ Players!